Some excellent cascabel peppers for the salsa. If you need ancho peppers buy these ones because they are of very good quality. In this recipe many ingredients are roasted at the same time and a large griddle is needed like the T-fal. 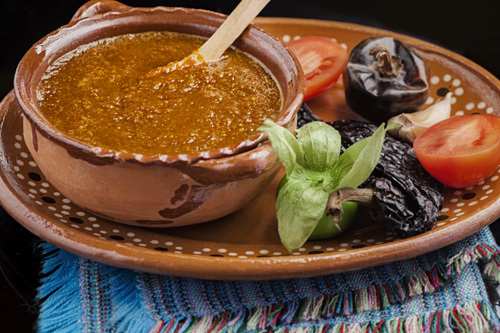 In this salsa 2 basic and essential ingredients of the Mexican cuisine are combined: the tomato and the tomatillo. Now, if these ingredients are combined with dried chilies, onion and garlic – we are going to have a salsa with guaranteed success. What is very appealing of this salsa is that it combines many flavors that are very Mexican like the acidic, fresh, sweet and toasted flavor. Moreover it is a very versatile salsa because it can be used while enjoying a snack or it can be used in appetizers or just put it on the table and when you notice it will already be finished. In this salsa there are many steps but all are easy. The salsa is spicy and if you want to reduce its hotness, just use 2 cascabel peppers. When the tomatillos are bought pick the ones that are greener and hard, this indicates that they are ripe. With this recipe you will get 2 cups of salsa. Discard the seeds and the veins of 2 ancho peppers and of 3 cascabel peppers. If you leave the seeds and the veins of the chilies, your salsa is going to be fire. The 3 Cascabel Peppers with the ones you worked. Transfer from the griddle to a bowl, with the tongs, the chilies that were roasted. Cover the chilies that were put in the bowl with boiling water. Leave the chilies that were put in the bowl soaking for about 5 minutes, until they soften. Roast the onion and the garlics for about 2 minutes, the tomatillos for about 3 minutes and the tomatoes for about 5 minutes, until all their sides are moderately roasted; move them regularly with the tongs. Transfer from the griddle to a blender, with the tongs, the onion, the tomatillos and the tomatoes that were roasted; then reserve. Peel the garlic cloves that were roasted, put them in the blender and reserve. Transfer from the bowl to the blender, with the tongs, the chilies that were soaked. Variation: Another of the few recipes where the tomato and tomatillo combination is found, is in the mother-in-law salsa.